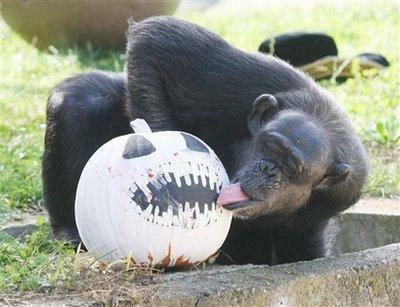 In this photo provided by the San Francisco Zoo, a chimpanzee lays a HOT French kiss on a pumpkin, Wednesday, October 21, at the San Francisco Zoo. Researchers from the University of Southern California are studying the kissing habits of various primates in an attempt to bridge the evolutionary gap between man and monkey. "Here we have a chimp administering a French kiss, yet primates don't even know about France or where it is, which would indicate there are a lot more similarities between the species than previously believed," stated Dr. Mikla Henndorf, professor of Anthropological Studies at the school.